> Feed your bees if necessary! March a dangerous time. March is a dangerous time of year for bees. It really is the make of break time for many hives. Healthy lively bees can dropped dead unexpectedly from one day to the next. One main issue is lack of food. The months of March-April are unpredictable. We get warm days followed by wet cold days. These weather spikes really disturb honeybee development. The workers feed the queen in times of warm weather to promote her egg laying and the development of new workers. However if the following days and weeks are then cold and wet all these new bees need extra food, so we have lots of hungry bees yet nectar production among the plants have shut down due to the bad weather. I had an angry reader contact me years ago concerned to read that bees can starve having little stores and wondered if we beekeepers were to blame for removing honey. I believe loving, caring, smart beekeepers will always but their bees before honey. In other words, we make sure never to remove honey that would put the bees at risk. 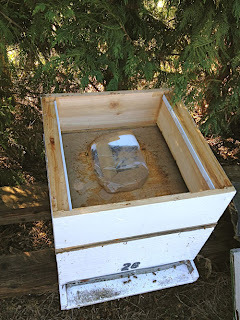 In many cases your bees will have plenty of stored honey that you left them, but because it is so cold outside they are unable to break their warm cluster and journey up into the honey boxes above. They can starve to death while the boxes above are overflowing with honey. A scene such as this breaks my heart and in many cases can be avoided with a little help from the beekeeper. So remember nature is cruel if we do not intervene. I am of the belief that I will get involved if the bees need a helping hand, rather than stand back and watch them die. Some naturalists believe that by providing an unnatural food source such as sugar is wrong. I do not hold such a cold view as bees are always thankful for a little help, which will in turn benefit the colony and the over all health and vitality of the colony. Well firstly never feed bees during a honey flow– this is a BIG no no! Only feed bees in the autumn, winter or early spring when no supers are on your hives. These are the times bees can use your help when no abundance of nectar is naturally available. 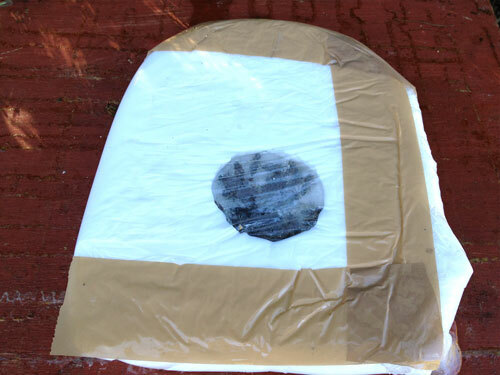 Buy a slab of bee fondant and wrap it in cling film to keep it fresh, clean and moist. Cut open a 5cm seam in the middle of the bag to expose the fondant and invert it over the coverboard holes. If possible the coverboard should be directly over the brood box. Use a super to add a space before placing the roof back on. 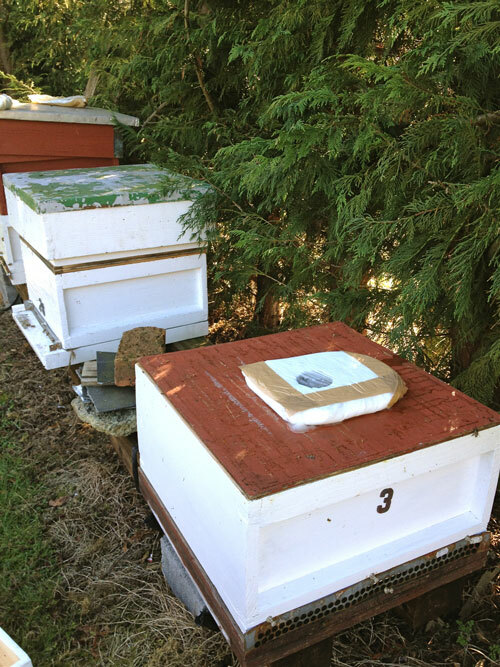 If you have stored honey for your bees in supers, place them somewhere safe until the weather warms up or they need the extra room. This exercise is to provide a ready food source as close to the bee cluster as possible during cold weather. Remember, though there may be flowers blooming, those flowers can not produce nectar in cold, wet, windy conditions. They look great, but are of little use to bees. 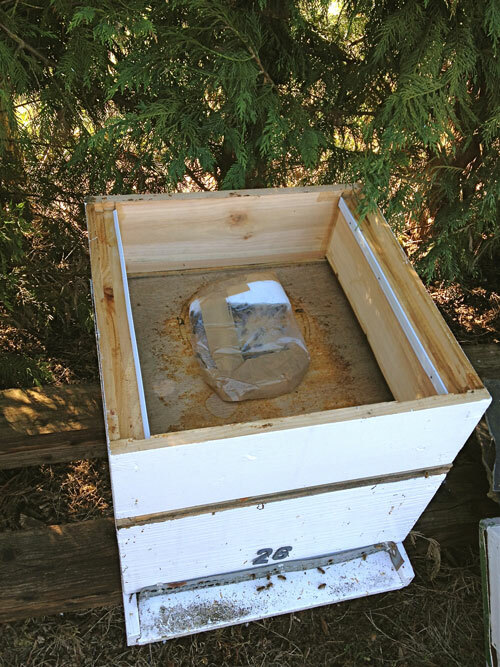 So now your bees are only centimeters away from the food source and will find it easy to consume this moist sugar supplement before the new nectar crop begins. We put one bag on each hive Christmas day without fail to say thanks you- if they need it, they will use it, if not they will leave it alone. Do not feed them sugar syrup. This is too difficult for them to metabolise in cold weather. Here are a few photos of the bees working our winter fondant bags. If you know a beekeeper pass this blog link on to them. It could help save a hive!